Our twin pack of P’s and Q’s offers two oral exercisers for practicing biting and chewing skills! 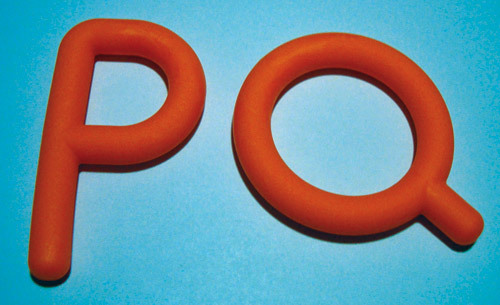 P’s and Q’s are made of the same FDA compliant material as all the Chewy Tubes products. They offer a safe, non-toxic durable surface for biting and chewing activities. In addition, they are lead free and latex free, and do not contain PVC or phthalates. P’s and Q’s are solid rather than tubular and offer a firmer surface for biting than the red or yellow Chewy Tubes. Young children enjoy grasping the P with their newly developing fine motor skills. The bitable stem of the P reaches back into the molar area providing valuable proprioceptive input into the TMJ during biting. Babies enjoy exploring the little stem on the Q with their tongue. At about 6 months when lateral biting begins to develop, the child will swing that little stem over to the side of the jaw for more intense biting. For larger jaws, the circle portion of the Q offers a firm bitable surface for bilateral jaw closure activities.